Taking back to the origins of the European Union, she showed that the EU was awarded the Nobel Peace Prize in 2012. 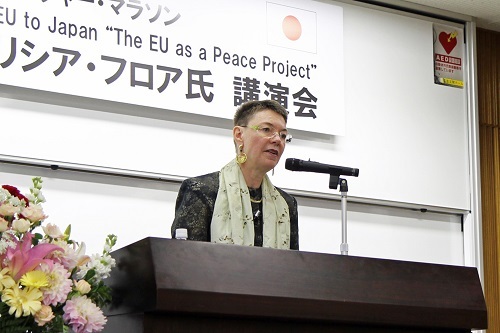 As the security environment in and around Europe has become more complex, she also advocated the role of the EU as a peace and security actor in international arena. The EU has addressed the internal and external challenges, in cooperation with the international community, aiming to better protect the Union, enhance the resilience of its partners and strengthen its role as a global player for peacebuilding and human security. The symposium attracted an attendance of about 300 people including HU’s faculty, administrative members and students, who listened avidly to the lecture. 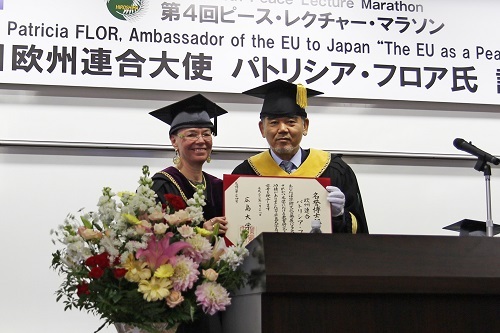 Following the lecture, President Ochi awarded H.E. 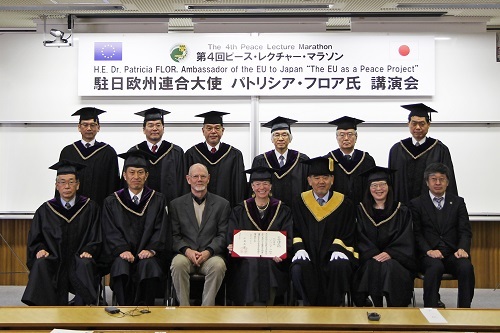 Dr. Flor Honorary Doctorate of Hiroshima University and the medal of the University. The lecture was followed by a group discussion with H.E. Dr. Flor and HU students from School of Law and Graduate School of Social Sciences. The students had opportunities to ask many questions to Dr. Flor about the relationships between EU and NGO, the current migration situation in the EU, and many more.